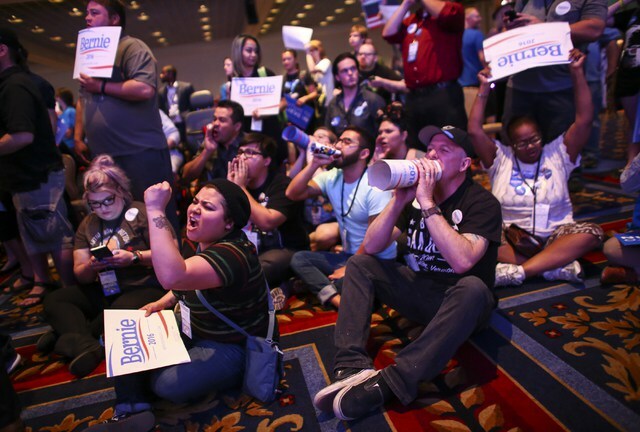 What happened at the Nevada Democratic Convention is awful and inexcusable, and Sanders needs to apologize; demand that his supporters stop such terrible, hateful, stupid, counterproductive behavior; and then carry on campaigning and talking about issues until the convention, by the end of which he should strongly endorse Clinton. All that being said, a lot of what Kevin Drum, Josh Marshall, Koz, and Paul Krugman are saying is overwrought, and I don’t pay much mind to them anyway, because they made it clear from the start they don’t like Sanders. All of them have been beating up on him for months. I am going to engage in some you-tooism here. Not on the behavior of some of his supporters, which is despicable, but on “feeling sorry” [as Krugman said about some Sanders supporters]—for Clinton supporters. I am truly shocked and disappointed by people who call themselves strong left-wing liberals who have been reduced to defending Clinton’s positions and actions on a wide range of things on which they would never have defended anyone else. I appreciate Clinton supporters who say, “I agree with Sanders on the issues but I don’t think he can win.” I understand that. But I have seen way too many Clinton supporters who defend her blatant changing of positions depending on who she is talking to (as we just saw last week with coal miners), her being buddies with people like Kissinger and Blankfein, her multi-million dollar contributions and speaking fees from Wall Street interests, her hawkishness on foreign policy, her actions in Honduras, her refusal to support Elizabeth Warren on major issues like breaking up banks and reinstating Glass-Stegall, her opposition to an immediate moratorium on fracking, her turning back decades of Democratic support for single-payer health care by saying “it will never, ever happen” and chastising people who support it, and several other items. For those of us who care about issues, this has all been a very sorry sight. We will vote for Clinton in November because the alternative is too awful to contemplate. But don’t sugar-coat her poor position on issues. None of which is to excuse Sanders for not forcefully condemning the actions of his supporters and demanding that those behaviors stop. It is extremely maddening and disappointing that he has not done that. I do want to add one addendum here, lest I be accused of being a fraud and hypocrite this fall: I did not mean to imply that I will vote for Clinton only because Trump is worse. In spite of my many and major policy differences with her, I also admire her in some ways. I think she has good experience, I like her strength on other issues including guns and reproductive rights, and I admire her for standing up to all the phony scandals and other crap that the Republicans have thrown her way. And I am excited to vote for the first woman president! Much like I feel about Obama– I strongly disagree with him on some issues and on some things he has done, but overall I greatly admire him and think he has been an excellent president. I am optimistic that Clinton can be the same. And I also recognize that this mainly a fight between liberals, albeit moderate liberals and left liberals. It’s not like we’re all conservatives!